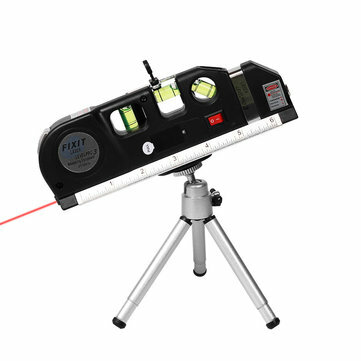 New Laser Level Horizontal Vertical Measure Tape 8FT Aligner. Hang shelves and cabinets, tiles and picture frames with accuracy. Projects horizontal or vertical laser light beam. Locking 8-foot measuring tape.Standard and metric rulers. Ideal For Any Job That Requires A Straight Line Or Accurate Measurement.Use this Multipurpose Laser Level for hanging pictures, installing shelving,laying flooring, hanging wallpaper and more.Laser light has an on/off power switch.